Annan lifted the points to go top of the Ladbrokes League 2 for at least one week after displacing current joint leaders and their opponents East Fife after a 2 goal victory. It was a hard fought and deserved win for Annan who went ahead in the 36th minute after a quick counter with Josh Todd and Smart Osadolor breaking from their own 18 yard line in an almost a carbon copy of the opening goal that Annan scored against Montrose the previous week. It was a lead that East Fife tried valiantly to pull back but in all honesty they did not look like overcoming it. The Fifers had a good spell in the second half but they carried little threat in the final third. The Annan defence were marshalled well by captain Stephen Black and they limited the visitors to very little if any clear cut opportunities. It was a super day for football played in glorious sunshine, no wind and after only two minutes the game produced clear cut chances at both ends. Josh Todd was back to his menacing best and in the opening minute Ryan Goodfellow pushed his net-bound shot for a corner, he followed this up immediately with a header which went narrowly over the bar. Goodfellow then pulled off a good save from Weatherson as Annan went all out to open their account in the opening minutes. East Fife’s best opportunity to score in the entire game arrived after only three minutes. It was a fine move created down by Craig Murray who won his way past Martin McNiff out on the right to finish with an inviting low cross which picked out Kyle Wilkie, he homed in from the left and somehow managed to guide his shot past Harts left hand post. It was a great opportunity squandered. Weathersons overhead effort in the 12th minute followed immediately by a Flynn shot were both blocked, Nathan Austin tested Swinglehurst down the right with the big Annan defender conceding a corner. The game then entered a 15 minute period with both teams defending their lines with no goal-scoring opportunities at either ends. The opening goal was one East Fife will want to forget, player manager Naysmith took a poor corner and when Annan intercepted from their own 18 yard line they broke with speed with Osadolor. He picked the ball up and the swift move left only one East Fife defender to face the threat of both Todd and Osadolor and the duo carved open the opportunity to great effect with Osadolor playing the ball into Todd who finished clinically with a low shot past Goodfellow. Following this setback East Fife replied when Austin’s shot was easily saved by Hart and as the game edged towards half time the visitors were presented with another opportunity when Watson conceded a needless free kick on the edge of the box but Walkers free kick was directed straight into the arms of Hart. 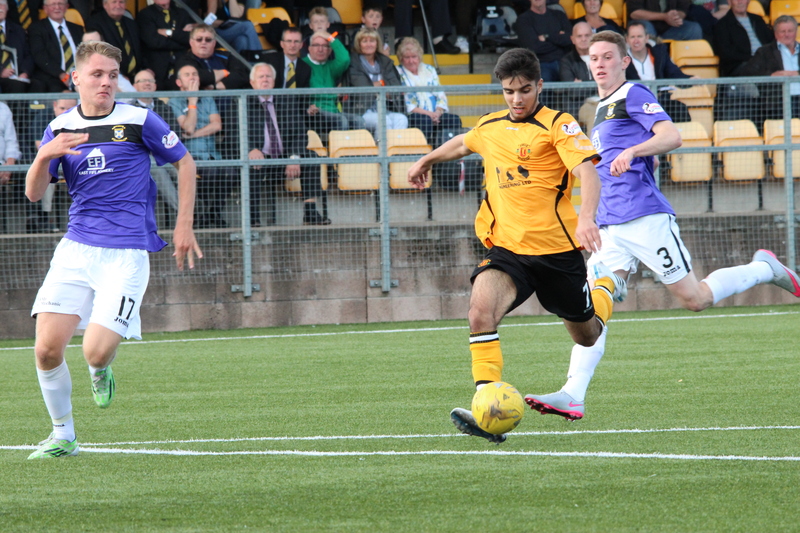 Annan started the second half on the offensive and shots from Omar and Weatherson tested Goodfellow. Naysmith’s 49th minute corner presented an opportunity for East Fife when the corner went across the face of the goal begging for a connection but it was an opportunity lost. Josh Todd was always a threat and in the 55th minute he combined with Weatherson to finish with a superb shot which cannoned off the cross bar, it was a real let off for the visitors. Osadolor then failed to take advantage of a slip by Mercer picking the ball up and homing in on goal only to finish with a shot wide of the keepers left hand post. As the half progressed East Fife started to dominate possession but they found it hard to find a way past the resolute Annan defence. In fact the closest they came to scoring was down to an error by Peter Watson whose attempted pass back in the 70th minute was intercepted by Nathan Austin who was denied by the alert Jordan Hart in the Annan goal, on another day it could’ve proved costly. On loan Motherwell player David Ferguson replaced Matty Flyn in the 75th minute closely followed by Scott Norman’s introduction for the injured Steven Black who had a faultless match at the heart of the Annan defence. As the match entered the final 10 minutes you could almost sense that East Fife had run out of ideas and it was Annan who started to look dangerous and it took a superb save by Goodfellow to deny Todd in the 83rd minute who finished off a fine Annan move. Rabin Omar sealed the points for Annan in the 89th minute after he picked up Osadolor’s pass to run straight through the heart of the visitors defence to finish with a low shot past Goodfellow from 12 yards. The victory for the time being lifts Annan to top place in the league, a position they have not held in a while but only one point separate’s 6 six teams. Annan now face successive away games at Clyde and Berwick over the next 2 weeks and it will be interesting to see how the league changes over this period. It is evident even this early in the season that there is very little between any of the teams and the battle for the top and the bottom places is more than likely to go down to the final matches of the season. ANNAN ATHLETIC: Jordan Hart, Steven Black (Scott Norman 80 min), Steven Swinglehurst, Martin McNiff, Peter Watson, Steven Sloan, Rabin Omar, Mathew Flynn (David Ferguson 75 min), Peter Weatherson (Stuart McColm 83 min), Josh Todd , Smart Osadolor. SUBS NOT USED: Blair Currie, Ryan McStay, Jamie Watson, Greig Macdonald. EAST FIFE:-Ryan Goodfellow, Pat Slattery, Jonathan Page, Allan Walker, Craig Murray (Ross Brown 63 min), Nathan Austin, Kevin Smith, Kyle Wilkie (Craig Sutherland 86 min), Gary Naysmith, Scott Mercer, Jason Kerr. Subs Not Used Fraser Mullen, Stevie Campbell, Declan O’Kane, Graeme McGregor.